People in the 1600's obviously needed something to do without boingboing to waste time on. That is cool. I would have loved to see a baked example! Those whacky Brits did all kinds of crazy things with pie back in the day. Mostly this was because, lacking refrigeration or cans, pie was a major food group and the main way to "preserve" food for the next day. Often the crust wasn't really edible, it was just there to seal in the food contents. It's like an early form of goldfish crackers -- "The friendly snack that glares accusingly back." You're in rare form this weekend. What? 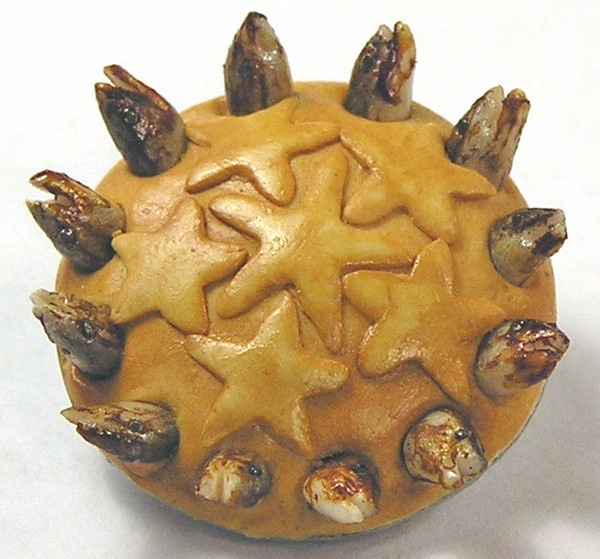 Everyone doesn't have a good stargazy pie joke sitting around just in case? I'd seen Stargazy pie in a scene in "Ladies in Lavender," an otherwise-charming movie w Judi Densch and Maggie Smith. It was quite disgusting then, but not nearly as disgusting as that picture. Ewwww is right.